Voted the 3rd most liveable city in the world by the Economist for the second year running, Vancouver is a sprawling, diverse, and beautiful city; a haven for technology, a thriving base for the film industry, an amazing tourist destination, and a cultural hotspot. Despite being the largest city in British Columbia and having the highest density population for a Canadian city, Vancouver is full of green spaces, surrounded by mountains, sea, and the wilds of the region. It has one of the largest urban parks in North America: Stanley Park. With a population of 631,486, Vancouver sits between the Burrard Inlet to the north and the Fraser River to the south. Vancouver is a bustling city with a vibrant day and night life, but still retains the calm, polite, patience of Canada. Vancouver is one of the most ethnically diverse countries in Canada. It’s classed as a Beta Global City, which is an important node in the global economic system. This is partly due to the number of global businesses, and high technology firms, which call Vancouver their home. Vancouver grew from Hastings Mill logging and a tavern next door initiated by “Gassy Jack” John Deighton in 1867. Gastown quickly grew with other stores and hotels and became Granville, B.I. (Burrard Inlet). It became the railhead for the Canadian Pacific Railway (CPR) and was renamed Vancouver, becoming a city in 1886. The seaport and rail links soon became a trade route between China, Asia, Eastern Canada and Europe. Forestry is still a large industry for Vancouver, alongside tourism, film production and technology. The history of Vancouver dates back nearly 10,000 years and was traditionally the territory of the Squamish, Musqueam and Tsleil-Waututh (Burrard) peoples of the Coast Salish. Villages existed on the sites of Stanley Park, False Creek, Kitsilano and Point Grey. The coast was explored by the Spanish in 1791, North West Company traders in 1808 and possibly Francis Drake in 1579. According the last census of 2011, only 48% of Vancouver residents cite their first language as English. Over a million residents speak a language other than French or English, with many speaking Chinese, Punjabi, Cantonese, Mandarin, Persian and Spanish. The biggest increase for the 2011 census was nearly 300,000 Tagalog speakers, the primary language of the Philippines. Vancouver is a coastal seaport, the largest on the West Coast of North America, in the Western province of British Columbia. It’s just over 228 km north from Seattle. 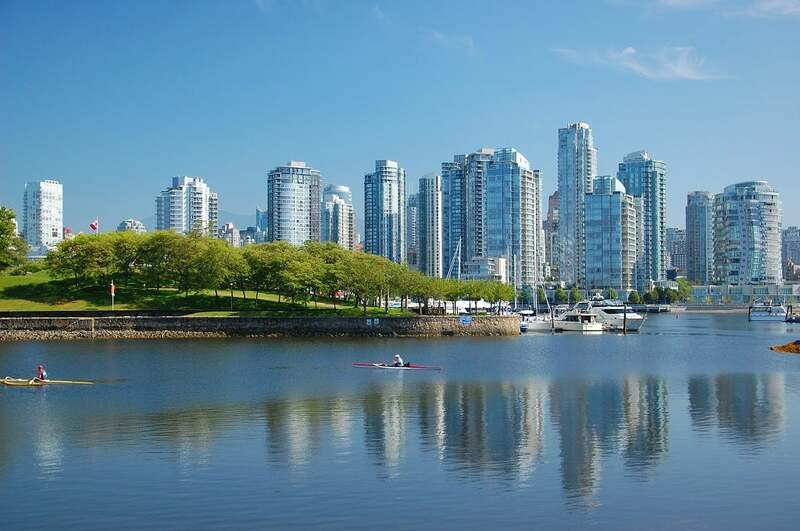 Vancouver covers 115 square kilometres, with a surrounding metropolitan area of 2,878 square kilometres, and a total population for the district of 2.5 million. To the west of Vancouver, across the Strait of Georgia is Vancouver Island which shields the Vancouver coast from the Pacific Ocean. A mix of flat lowlands and hills with a backdrop of the North Shore Mountains. On a clear day you can see across to Vancouver Island and southeast all the way to the snow-capped Mount Baker in Washington. Bowen Island sits to the northwest. Driving north out of Vancouver you will quickly meet the incredible mountains and forests of British Columbia. Described as a climate of temperate rainforest, and oceanic or marine west coast, Vancouver is one of Canada’s warmest cities in the winter, but cooler than most in summer. Vancouver is known for its rain and cloud cover, exacerbated at times by smog. The city has an average of 11 days snow fall with occasional falls of a few inches, which typically does not stay on the ground for long. Summer in Vancouver is not so wet, and there is an average of 1938 hours of sunshine annually. Before logging in the region Vancouver had some of the largest coniferous trees on the British Columbia coast. There are many plants and trees which grow in Vancouver and the Lower Mainland of BC which were imported, including the Monkey Puzzle Tree, Japanese Maple and the Japanese Cherry. The latter were donated by the government of Japan in the 1930’s and line many of the city’s streets, flowering for several weeks in early spring. The event is celebrated by the Vancouver Cherry Blossom Festival. Vancouver is a high-risk area for earthquakes and research has shown there is a one in four chance Vancouver will be struck by a major earthquake within the next 50 years. There is actually a minor earthquake in the Lower Mainland of British Columbia nearly every day. Vancouver sits on the edge of the huge North American tectonic plate and the smaller Juan de Fuca plate which is moving forward in an area known as the Cascadia Subduction Zone. The zone is able to produce earthquakes larger than magnitude 9.0, and the last of this size was in 1700. Although coastal British Columbia is at risk of a Tsunami, Vancouver is classed as a low-risk area. Make sure you know about the visa regulations before you head over to Vancouver! Despite historic links and proximity, it’s no easier for Americans to move to Canada than any other nationality. Canada’s immigration policy is completely neutral to race, gender and country of birth. Canada is in search of skilled and qualified migrants, or those who are able to support themselves when they move to Canada. There are federal immigration schemes for Canada as a whole, but also provincial immigration schemes that may mean faster immigration if you can gain a nomination from your chosen province. Here are most of the immigration routes you can take into Vancouver. This is a points based system. You are awarded points for certain factors including your skills, education, language ability and experience. Additional points are awarded for a job offer from a valid employer or a nomination from a Canadian province. The system can change frequently but you may be able to reach the points threshold without a job offer, and usually a job offer or provincial nomination will put you over the points threshold. If you have a qualifying number of points you are eligible to enter a draw. The federal government frequently chooses candidates over a certain points threshold who are then invited to apply for permanent residency. If you have a job offer you can usually gain a temporary work visa and move to Canada while you are waiting to go through the process of permanent residency. To take a job in Canada your prospective employer will normally need to prove that there is not a Canadian applicant available with the skills for their role. The federal government publishes lists of job categories which are classed as in demand and likely to lead to immigration for a suitable applicant. If you’re an entrepreneur you can enter Canada and start a business which creates jobs for the Canadian economy. But you must gain support from a designated organisation, meet ownership requirement and have enough money to settle. Though closed right now the Immigrant Investor Venture Capital Pilot Program is a route to consider if you are fortunate enough to have a net worth of $10 million CAD plus! However, you must have gained this through business rather than an owned property or an inheritance. The self-employed category is limited to those with relevant experience in cultural or sporting activities and who intend to contribute to the cultural or athletic landscape in the country. Or, those with experience managing a farm and who intend to purchase and run a farm in Canada. You can be sponsored by a family member already in Canada. They must already be a citizen or permanent resident and should be a spouse, partner, parent or child. You can also consider immigration routes through the Provincial Nomination Program for British Columbia, in order to move to Vancouver. For some schemes you will need to meet the criteria for one of the federal programs too, and the process of applying may overlap. The British Columbia Provincial Nominee Program (BC PNP) has a number of immigration routes including Skills Immigration, Express Entry BC, or Entrepreneur Immigration. The BC PNP, as they describe, is a way for high demand foreign workers and experienced entrepreneurs to gain permanent residency in British Columbia. For skilled and semi-skilled workers for high demand occupations. This is a points based system and work experience is not required for some categories. For some categories you may need work experience gained in America or elsewhere. The Entry Level and Semi-Skilled categories are applicable for those who have already lived and worked in BC. Graduates from a Canadian university or college may not need any work experience. This program is for skilled workers who also qualify for a federal economic immigration program. Again, it’s a points based system. You do not need work experience gained in British Columbia but you must have relevant work experience and meet education and language requirements. Again, a points based system, if you have a high net worth and wish to invest in, and manage a valid business it may apply to you. If you are working for a company looking to expand into the Vancouver area this will open up a further route to immigration for you. The technology sector, with its base in Vancouver, is vital to the growth of British Columbia. The provincial government recognises this and is keen to assist the immigration of technology professionals to the province. They have recently introduced the BC PNP Tech Pilot which may speed up, and increase the chances of, permanent residency in Vancouver. Full details on eligibility and criteria for the BC PNP can be found here. Americans travelling to Canada, or travelling through one of Canada’s airports, do not require a Canadian eTA if they have a valid US passport. There is a US Consulate office in Vancouver. The consulate can help American citizens in an emergency, help deal with passport issues and offer certain other services. The list can be found here. Once you have made travel plans and looked at necessary documentation for you and your family, it’s time to consider other members of your family – your pets! The Canadian Food Inspection Agency will require documents for an animal travelling to Canada, as long as it meets their import requirements. Dogs and cats coming from the USA, will need a rabies vaccination certificate but will not need to be quarantined. Birds, rodents and horses are also allowed but there are some rules. Rabbits do require quarantine. The Canadian government website is an excellent resource for anyone moving to Vancouver or indeed anywhere in Canada. Vancouver airport is the second largest in Canada, next to Toronto. There are direct and regular flights to Vancouver from many US airports. It’s easier to fly to Vancouver from most US destinations. Unless you are looking to take a cruise on the way. In which case Vancouver is the home base for the Vancouver-Alaska cruise route. You can of course choose to drive to Vancouver from anywhere in the US easily. There are also a number of Amtrak rail routes. From the USA to Vancouver you will need to move your belongings by land. You either choose to do this yourself or hire a shipping or removal specialist. Remember that you need to pack your belongings, including any furniture and breakables for a long road journey, hire a vehicle, and make sure you have a driver. A shipping and removals company will work with you to completely secure and transport your belongings. If you take a full service, they will create an inventory, pack, load and transport from your old home to your new home, stress free. A shipping and removals company will also take care of things like insurance and customs requirements. If you are shipping your possessions you must make sure they are wrapped safely and securely and protected from damp as they could be in transit for a while. You can ship your belongings ahead of time so they are waiting for you when you arrive. If you are going to be waiting for the rest of your items when you arrive in Vancouver, it’s important to pack what you will need immediately, and to pack appropriately for you how you will be travelling. Take important documentation with you when you travel, ideally in your hand luggage if you are flying. This should include things like birth certificates, passports, visa’s, marriage certificates and bank cards. Create digital copies of your important photo’s, paperwork and documents and make sure they are stored safely so you are prepared for any lost luggage issues. Although rare they do happen. Look closely at weather forecasts when you arrive and plan clothing accordingly. If you are starting work or have children starting school immediately what might you need? All that said don’t give in to the temptation to overpack. Only pack what you can comfortably carry transport with you. British Columbia has the lowest unemployment of all the Canadian provinces sitting at 6.3 per cent, and Vancouver at 5.1 per cent. There are still many jobs being created and available, especially for those with skills in business, finance, technology, healthcare, tourism and hospitality. Skilled tradespeople are always in demand for Vancouver and across the province. Vancouver is quickly becoming the Silicon Valley of Canada. Amazon, Microsoft, Hootsuite and games giant Electronic Arts all have offices in Vancouver with more than 1000 employees. There are many more technology companies and high-tech start-ups adopting Vancouver as their base which adds daily to the growth and success of the busy metropolis. The federal government jobs website is Job Bank. Employers who might look to find a foreign worker must also have advertised on Job Bank to ensure there are no Canadians available to take their role. So, most jobs suitable for migrants will be posted on Job Bank. Other job sites like Indeed, LinkedIn and Monster are used widely across Canada. To work in Canada, you will need a Social Insurance Number (SIN) which you must apply for when you arrive, at a Service Canada location in the city. It’s a simple process if you have your work visa. You will need your SIN number to access any government programs and benefits. If you become a resident of Canada, or have a work permit, public schooling is free. Every child in Canada has a legal right to education and there are no tuition costs for Grades 1-12. Excellent private schools are also available. In Canada elementary schools provide kindergarten years for ages 4 and 5, and then education from grades 1 to 5 or 8. There are also middle schools for grade 6-8. Then, secondary, also known as high schools, until grade 12 and roughly age 18. Due to the sheer size of Canada and it’s forward thinking, home schooling is common place and there are many excellent home school organisations. You can also choose French Immersion schools where most of the curriculum is taught in French, these schools are open to native French and English speakers. Most of the curriculum is designed for students who do not speak French at home. In these schools teaching in English is introduced at grade 4, or for specialist subjects. There is a public Montessori school in Vancouver and a number of schools which offer a Mandarin bilingual program. There are private and international schools in Vancouver including a French school, girls school, school for the gifted, and some with boarding opportunities. There are also technology focused schools – not surprising for Vancouver! UBC is ranked 36th in the world by the Times Higher Education (UK) 2016 rankings and is consistently in the top 40 rankings by organisations around the world. It has 60,000 students between its Vancouver and Okanagan campuses and is strong in Arts, Science, Applied Science, Medicine and Business. A newer university with 30,000 students, it’s the only Canadian university competing in the National Collegiate Athletic Association (NCAA). It’s also the first Canadian research university with US accreditation and ranked one of the best in Canada. Teaching focused Capilano was dedicated a University in 2008. It offers certificates, diplomas and degrees at undergraduate levels, and has liberal arts, music, professional and career programs. Public health insurance is available to eligible citizens and permanent residents. In BC it’s called the Medical Services Plan (MSP) and covers the cost of medically necessary insured doctor services. You have to pay monthly MSP rates which help to meet a portion of the costs. Housing costs are higher in Vancouver due to sheer demand, giving the city a higher cost of living than most of Canada. There are sprawling suburbs so you can choose to be a good distance from the city, but still an easy commute away. Monthly rent in a normal Vancouver area for around 900 square foot will set you back $1,890 CAD, with around $187 CAD in utilities for two people. A beer will cost around $4.04 CAD, 12 eggs $4.86 CAD, and a meal for one in a fast food restaurant $9 CAD. The average monthly disposable salary is around $3,281. The road network across Vancouver and out of Vancouver is excellent, but parking within the city is of course limited and can be expensive. Traffic can be heavy during peak periods and the roads are certainly busy, but not overloaded. There are no freeways into or through the downtown area, and as Vancouver is surrounded by water on three sides there are several possible bridges to navigate. Vancouver has the SkyTrain system, the longest automated light metro system in the world, with the longest transit-only bridge, the SkyBridge. There is an excellent bus system which is wheelchair and bicycle friendly. In busy areas like downtown Vancouver, buses run every few minutes. West Coast Express operate a heavy commuter train throughout the region. Unlike many North American cities ridesharing services, such as Uber, are banned. A modern thinking city, Vancouver operates 300 kilometres of road bicycle routes many of which have traffic calming measures to create “bikeways”. The city is developing their offering to cyclists to encourage the use of bikes in the densely populated areas, and for commuters. The Central Valley Greenway, opened in 2009, connecting Vancouver to Burnaby on a 25-kilometre route, was used by 2,000 cyclists per day within a month. Vancouver International Airport is one of the busiest in the world and serves most US and many international cities. There are also helicopter and seaplane flights available daily to Vancouver Island and Seattle. There are several ferry routes between Vancouver, the Gulf Islands and the US. There are mix of passenger and passenger and car services available. A SeaBus also operates between downtown Vancouver and the City of North Vancouver, crossing the Burrard Inlet. You are able to drive in Vancouver for 90 days with your US driving license, after which you must exchange it for a Canadian driving license. You can do this by taking your documentation to a Service Canada location where you can complete the process quickly and be provided with a photographic driving license. Moving to Vancouver will leave you spoilt for choice for a new home. Though property is incredibly expensive in the city itself there are many suburbs and surrounding districts to choose from. If you have the money, choose from upmarket Shaughnessy, quiet, green, residential and very expensive. Or downtown Yaletown with its lofts, condos and nightlife. Lower Lonsdale is a historic waterfront neighbourhood, so still expensive. Hastings on the east side is more family friendly and close to many schools. There are 23 neighbourhoods in all, split into west side and east Vancouver, the west is more affluent and more expensive, east Vancouver is more working class, and more affordable. For families the best places to start your search for a place to live are West Point Grey, Dunbar, Grandview, Mount Pleasant and Riley Park. As well as needing to entertain its millions of residents, the Vancouver area is a renowned tourist destination. From those looking to take advantage of fishing in British Columbia, whale watching tours, and exploring and hiking the wilds. Right through to those on the way to nearby ski destination Whistler. Vancouver mixes scenic views with more entertainment than you could ever experience. In 2011 it was the Cultural Capital of Canada. If you are looking for a little quiet you can stroll the waterfront or explore Stanley Park. Downtown landmarks include the Gastown Steam Clock or the Vancouver Lookout. There are many box office hit movies filmed in Vancouver so you may even catch a peek at a celebrity! There is a fantastic array of restaurants and café’s, or you can explore the Granville Island Public Market for fish, cheese fruit and sweet treats. There are many museums, theatres and art galleries, plus a few more unusual attractions like the Stanley Park Seawall, Capilano Suspension Bridge Park and the Bloedel Conservatory. Events in Vancouver reflect the cities diversity and range from culture, theatre, pride, film music and family fun. There is a free fireworks event during the summer – the Celebration of Light over English Bay. The Vancouver Music Festival, Jazz Festival and Craft Beer week are great for adults, and the Vancouver Film Festival is an international event. Vancouver, and nearby Whistler, hosted the 2010 Winter Olympics. Matches of the 2015 FIFA Women’s World Cup were played in the city including the final. Vancouver is a major destination for outdoor recreation and home to those who enjoy it. The beaches are large, water sports, boating and fishing are all very popular. There are major ski destinations within a 30-minute drive. Cycling races are scheduled through the city, and a number of marathons. Vancouver has professional football, hockey, soccer and baseball teams. Tell us where you're moving to and compare prices from up to 6 trusted removal companies to see how much you could save today.